You must play offense and defense during every turn, and danger is always near. The game is fast-paced and can be over in just minutes. Sudden finishes are common! 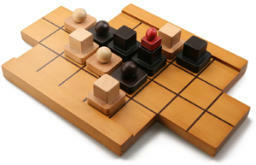 Each player controls a team of 5 game pieces, and the game flows and changes rapidly. Experienced players have a big advantage over novice players. Each turn consists of two moves (maximum) and a push. 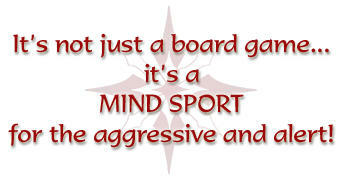 The goal is to push ONE of your opponent's game pieces off the board at either end. You can also win by getting your opponent to give up because they are trapped. In essence, it is a submission fight on a game board. Created by a Jiu-Jitsu practitioner to train his students, Push Fight is a pure strategy game of positioning, foresight, and force. 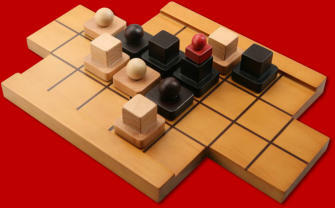 Each player takes turns moving their pieces into advantageous positions, and then pushing with one of their pieces. A back-and-forth game of lures, escapes, and clever aggression ends when a single piece is pushed off the board. For a quick look at how Push Fight works, check out these videos.